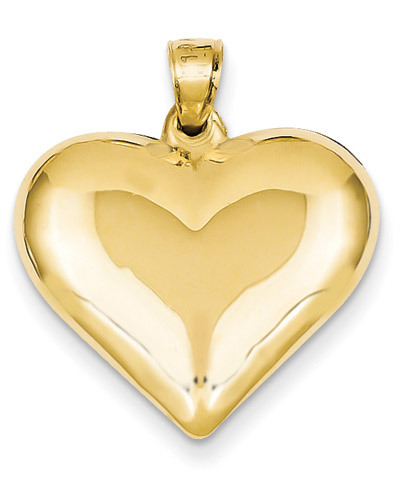 A fine polished 14K yellow gold heart necklace from our unique Heart Pendants collection. Heart measures approx. 7/8" wide x 1" tall with hoop. This gleaming heart pendant captures the warmth of your affection with a classic symbol and a timeless precious metal. A polished three-dimensional heart hangs simply and elegantly from a matching bale in this 14K gold polished heart necklace, creating a look that communicates your love with trend-surpassing elegance. At approximately 7/8" wide and 1" tall (including the hoop that holds it), this piece is eye-catching and just bold enough as it showcases both the splendor of 14K yellow gold and the beauty of your love. We guarantee our 14K Gold Polished Heart Necklace to be high quality, authentic jewelry, as described above.